Magnolia is a magnificent movie, one that aims high for the sky and hits its direct target. It is a true gem of cinema, one of the greatest films I’ve ever seen. This is director Paul Thomas Anderson’s crown jewel, and this is from a director who has made some of the best films of the last fifteen years, like There Will Be Blood, The Master, and Punch Drunk Love. Like Anderson’s other films, Magnolia is not for everyone. Some find it pretentious and overlong while others criticize its narrative style. But Magnolia is done perfectly. There is not one single second of the film I would have taken out and not one second I disliked. It’s completely engrossing and is made up of many layers. Magnolia is as epic as Lawrence of Arabia, as emotional as E. T., and as thrilling as Apocalypse Now. The movie stretches out over three hours yet I could have sat in my seat for five hours watching the events unfold. Magnolia opens up with a sequence narrated by Ricky Jay who tells the audience about great coincidences. He gives three examples, one of which involves a man committing suicide by jumping off a roof. As he is falling, he is killed by a shotgun blast before landing in a net that would save his life. His mother fired that gun, but she aimed it at her husband but missed. The gun was not supposed to be loaded but the son had done so a few weeks before in hopes that his parents would kill each other. Another coincidence is about how a scuba diver is killed in an unlikely incident. He is swimming in a lake when all the sudden a seaplane swoops down and accidently picks him up in an attempt to dowse a forest fire. As it turns out, the scuba diver works as a black jack dealer at a local casino and the pilot of the seaplane got in a fight with the dealer before when he lost a car game. The pilot, now feeling guilty, commits suicide. Anderson then brings out the central stories of the film. Magnolia is about a group of people’s lives in one day in Las Angeles. Each of Anderson’s stories has similar themes, such as death, resentment, and forgiveness, but they are all unique. One of the stories has to do with Stanley Spector (Jeremy Blackman), a smart, young boy who is close to beating a record on the game show What Do Kids Know? His father (Michael Bowen) encourages Stanley to beat the record but in reality is only concerned on the cash prize. The game show host Jimmy Gator (Phillip Baker Hall), at the same time, is dying of cancer. He tells his daughter Claudia (Melora Walters) about this, but she resents him. She’s resorted to snorting cocaine each day in her apartment while listening to music at full blast. Anderson also gives a story about “former quiz kid Donnie Smith” (William H. Macy). When he was a boy he was a child star on a game show like Stanley but now he’s a drunk with a bad job. He wants to get orthodontics to attract a bartender, but is too shy to even talk to him. Another narrative is about Earl Partridge (Jason Robards), an old wealthy man also dying of cancer, wants to see his long-lost son before he dies. His nurse Phil Parma (Philip Seymour Hoffman) attempts to find him and discovers Earl’s son is Frank T. J. Mackey (Tom Cruise), a stud who runs a program on seducing women. Mackey resents his father since he abandoned him and his mother as a child when his mother had cancer. Meanwhile, Earl’s second wife Linda (Julianne Moore) searches for redemption. She had originally married Earl for his money but now actually legitimately cares about him. She knows that she will receive a chunk of his estate when he dies which she doesn’t want. There is also the story of Jim Kurring (John C. Reilly), an officer who is fervent with Christianity. Like Phil, Officer Kurring serves as a caretaker for the characters. He comforts Claudia and even asks her out on a date, despite her pathetic state. There are many parallels between these different events which all intercut with each other. Many films with multiple stories tend to be predictable, but Magnolia is completely different. It takes twists and turns and the ending is so unexpected that I was agape with amazement. I won’t spoil it, but I doubt anyone would have actually guessed that. Magnolia is a golden achievement for director Paul Thomas Anderson. Anderson made this film when he was 28, which is incredible seeing that there are directors who couldn’t accomplish this when they’re twice his age. Paul Thomas Anderson has complete control over the film, never loosing his course. He delves into the lives of his characters and switches to different stories at the most precise moments. He commonly uses steady-cams in the film, which he executes brilliantly. One scene features Stanley walking into the game show building. The audience first assumes this was meant to show Stanley has just entered the building but it is in reality much more. The audience is then shown the cameramen setting up the set, Jimmy talking to his wife, and Stanley’s dad walking down behind the scenes until Anderson finally places the camera on the front of the stage. I was reminded of the Copablanca scene in GoodFellas, which Anderson must have taken into consideration for this. Anderson also hints themes of religion. One obvious indication of this is Officer Kurring, but there are plenty of more clues. Children are meant to represent prophets, foretelling the future to adults (this is highlighted by Stanley and another boy). The movie also deals with forgiveness and love, which are repeated throughout the film. The greatest triumph of Magnolia is its cast. I don’t think there has been a ensemble as good as Magnolia’s. I knew I was going to like the cast because some of my favorite actors, like Philip Seymour Hoffman, Julianne Moore, William H. Macy, and John C. Reilly, but I didn’t know I was going to love it as much as I did. Every performance is fantastic. Moore is brutal in her role, Macy and Hall are tearful, and Reilly is forgiving. But Tom Cruise is the one who really steals the show. 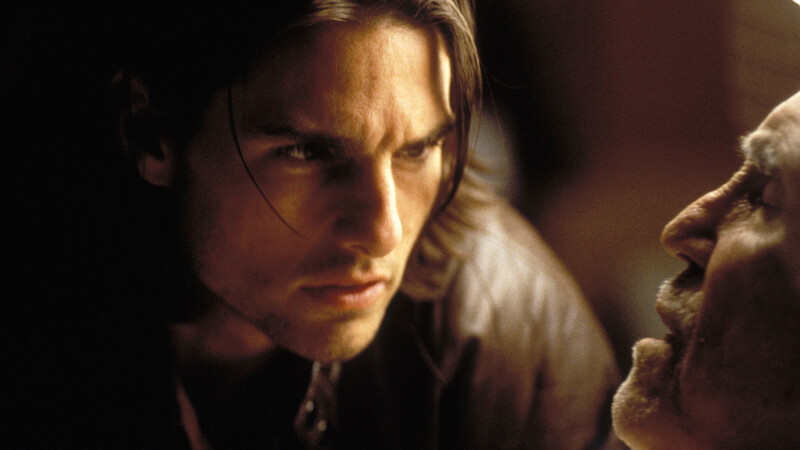 I’ve never been a Tom Cruise fan in particular but he was amazing in the movie. Out of all the characters in the movie, Frank is the deepest and most layered. As the film progresses, the audience learns more and more about him and connect with his situation. Magnolia is a filmmaker’s dream, a great accomplishment that will surely be recognized as a great piece of art. It’s a film that comes once every blue moon, one that challenges filmmaking and pushes the gold standard. « What’s your favorite movie soundtrack? Great review. I remember having to analyse the opening scene with all the coincidences during my film studies degree and it was great dissecting it all. It’s definitely one of those films that divides opinion, PTA seems to be developing a habit of that! Out of all of what I’ve seen from Anderson, this is my favorite. It’s definitely a film to rewatch to examine all the themes. Thanks for commenting. Great post, the scene that I always remember is the raining frogs. Strange yet very memorable. The scene is so strange yet so magnificent. I was in awe when it occurred. This has quickly become one of my favorite movies and I loved every second of it. Thanks for commenting. Paul Thomas Anderson succeeds with this where I think a lot of other directors would have failed. Yeah, what’s really amazing is that he made this film when he was only 28. Most directors can’t accomplish something like Magnolia in a lifetime. Nice post, William H. Macy floors me every time I watch this. Macy is great in his role. Thanks for commenting. Jesus! What a terrific movie! It’s not only my favorite from Anderson, but definitely my favorite Cruise performance of all-time and shows exactly why the guy is no slouch when it comes to powerful, dramatic-acting. Good review. Thanks! It’s my favorite by Anderson as well and Tom Cruise does a fantastic job. Anderson’s films have actors in top form and Magnolia has quickly become one of my favorite films. Thanks! Yeah, this may have the best ensemble cast ever. Definitely by favorite by Anderson.